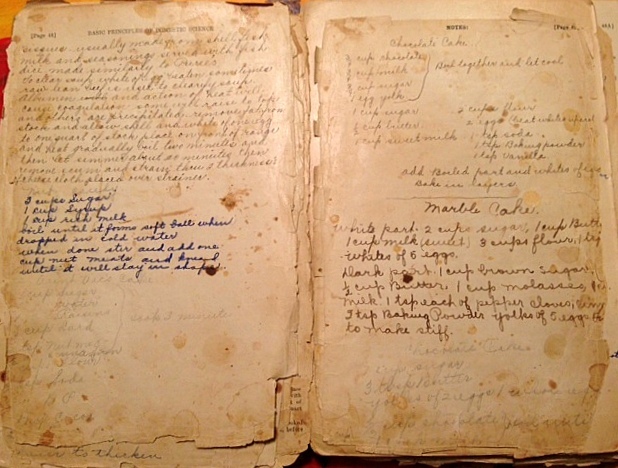 A Cake Bakes in Brooklyn: Do You Write in Your Cookbooks? On Wednesday, The New York Times published a fabulous story about the value of hand-written notes in the margins of cook books. In case you missed it, you can read it here. I take this one step further, collecting hand-written recipes, whether they be written in composition notebooks, above, or on cards, at bottom. 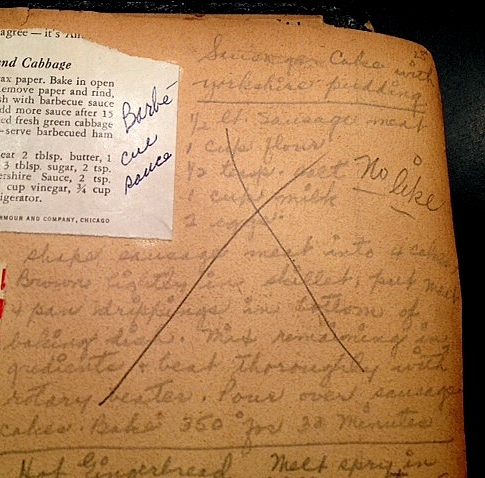 And some of the hand-written recipes I collect even have "margin notes," as this one for sausage cake which has a big X through it and the notation: no like. Oh yes -- I write in my cookbooks and I love your blog! Making notes is how I keep track of what I like about a recipe, what I might do differently next time, if there's going to be a next time. I make notes in the margins of my cookbooks, scrawl all over my own handwritten recipes and type in notes on my electronic recipes. "Document, document, document" as they say. I liked that NYT article! And I too write in cookbooks and like to see what other people have written. It's only natural. A recipe is always going to be more than half a cup of this and a pinch of that; recipes mean food, which ultimately means family and friends, which ultimately means memories greater than the sum of the recipe's parts. I write in them all the time and date my notes to. SInce I'm often changing the recipe it helps me remember what I did, or if the original recipe was worth making again.